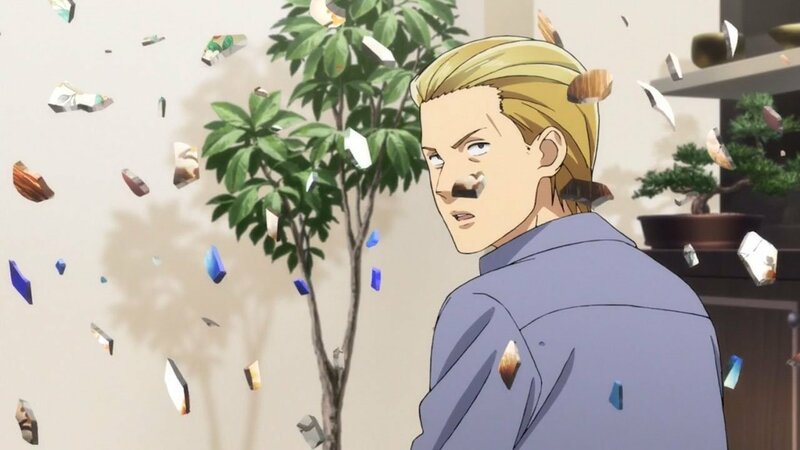 Hinamatsuri episode 1-Arrival of the Psychokinetic Girl! I’m not the biggest fan when it comes to slice of life(SOL), yet I found this episode captivating. 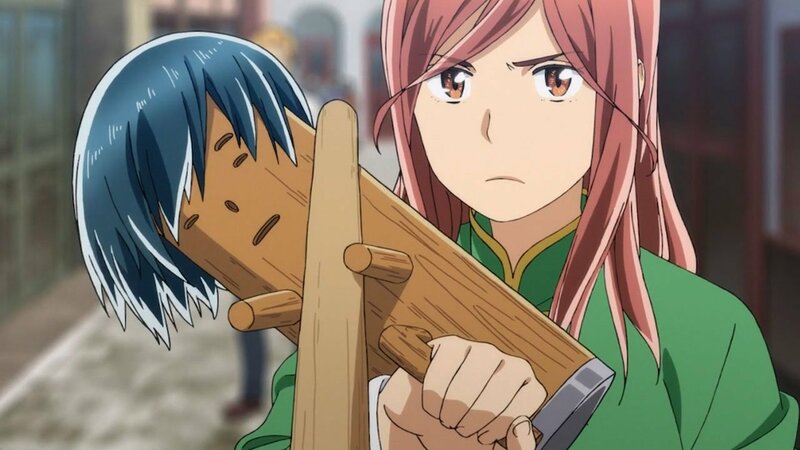 From one of our writers, Kuma, suggesting me to watch this anime, it caught me off guard. Possibly due to the fact of the compelling art design or extremely soft moments presented within this Hinamatsuri episode 1. If you wish to know more about it, in precise details, go here. Before the event previewed in the synopsis came to a realization, a scene is presented foreshadowing something. A girl fighting against 3 other martial artists in a street. She Delivers a fair amount of blows to put them unconscious. Although it’s rare for that to be a starter of a Slice of Life. Instead of going for a relaxed start, they go for an action scene, interesting choice. Now the real event, as the synopsis says, a Yakuza named Nitta gets struck in the head. By who? None other than a young girl named Hina. Hina is a girl that lands on Nitta’s house in a metal structure that can be disjointed if the button is pressed. Nitta at first ignores it and goes to sleep. In the morning after, he finally decides to touch the button. A cute little girl shows up. What this reminded me of, was the typical generic harem setting. Don’t be alluded though, Nitta is an adult and reacts in a way more caring than anything. For his bad luck, Hina breaks his most valuable possessions, those being the vases. He freaks out, his reactions were sorta in the place considering the event. Hina’s powers are discovered then. The supernatural ability to control anything at will is what I would assume in this scenario. 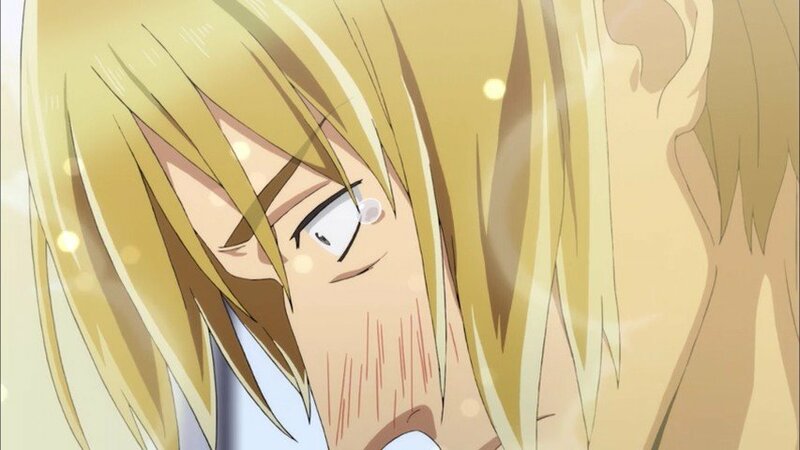 It’s not too soon that Nitta realizes that his very own life could be endangered, so he makes a proposal to Hina. That being that she could stay there for as many as she would like. The Merciless yet humorous threatening went. Nitta took Hina out to dinner, taking Hina into a first time Sushi experience. She was so eccentric to the point of repetitively asking the second plate every second. Adorable honestly. Nitta’s reactions were on point, to be honest. Moments after, Hina finds out about school and wants to enter it. Nitta takes that moment to declare that if Hina stopped using her powers he would put her in school. 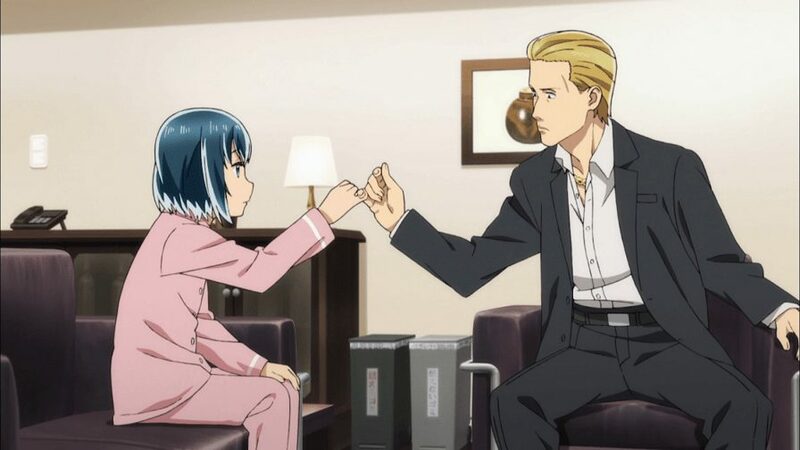 Not even in denial, she goes for a pinky promise with Hina, and so a bond is formed.Quite the feels play by Hinamatsuri. This bond feels more of a daughter and father type of bond more than anything. Well to tell you the truth, it was heartwarming that moment. What made it more likable was that Hina is now named “Nitta Hina” with Nitta’s name. The process of a development is noticed, small development yet a progressive one. 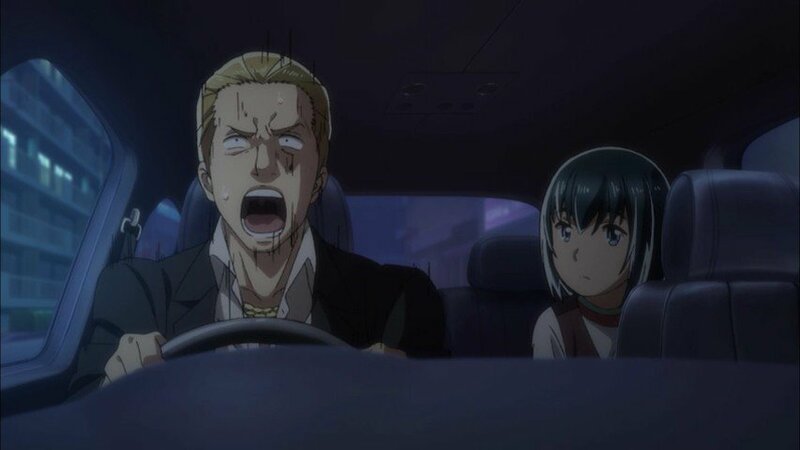 This Hinamatsuri episode 1 was already going this good. Just when you thought it couldn’t get more soft-hearted moments. Right after Nitta tests out Hina’s power, it’s witnessed a much more wide extension vision of her capabilities. Being able to move trees, peel the wood off, organize them, etc. All this because Hina blew up Nitta’s house on the inside, again. Hilarious to watch Nitta’s despair, won’t lie. It had a small dark turn in the second half of this Hinamatsuri episode 1. It was a surprise. Because Nitta went out to make those tests with Hina, but apparently his boss needed him. For Nitta to make his payback he had to kill their boss. The typical Yakuza set out.To see a Yakuza setting, truly something out of the ordinary, in most cases. A great portion of this Hinamatsuri episode 1. Nitta puts a serious glare on, it made me even question if I was watching the typical Slice of Life. As the deadline breaks out, Nitta has his nervous small talk for a while. It made the atmosphere gain a more heavyweight setting. Only to be shattered by Hina. Her persona is focused on only taking orders, mainly to kill. Hence why she says who she has to kill. For the contrast, she gets denied. He says that it is his own trial, so he must pursue it until the end. That’s when Hina realizes the difference between Nitta compared to her previous order givers, Nitta’s kindred soul is potentially one of a kind. While he is a Yakuza he cares very deeply, or else he wouldn’t have done all that for Hina. Realizing that she pursuits to find the boss in a witty way. She walks in with fashion, using her power to throw every person in the building outside. Until she found the boss. Even Nitta was surprised, but as he said in the episode, her powers can be used for a greater purpose. In the end, all ends well, Nitta manages to walk without consequences due to Hina’s help. While Nitta lands a good impression on his partners, saving his way out of it. “This is How You Have A SuperPower Battle!” it issues that there will be a battle. I hope it’s between Hina and Nitta, who knows what could happen next, a good cliffhanger.A good play by this Hinamatsuri episode 1. While I had 0 expectations to this, this Hinamatsuri first episode did prove me wrong in several ways. Perhaps through its ways of making the slice of life theme a more abrogated one. The art style and graphics are up to date, which I like a lot. To see outdated graphics and mostly CGI isn’t exactly a pleasable surprise. This is definitely a good series if you had a rough day and want to lay back while being able to relax. Not only do I recommend this so far, you don’t even need to be a Slice of Life fan. But it’s fun overall if you have free time give it a shot. While you are at it, do check this out! Do let me know, down below, your thoughts as well, on this Hinamatsuri episode 1.